Sky Sports 1 goes free for Premier League kick-off | What Hi-Fi? Sky is to kick-off the Premier League season with a free day of Sky Sports, the latest move in the increasingly competitive battle between Sky and BT. Saturday 17th August, the start of the Premier League season, will see Sky Sports go free for the day, allowing people without a Sky Sports subscription to enjoy, amongst other things, a live Premier League football match. Sky Sports 1 will replace regular programming on Sky 2 if you have Sky or Virgin, while for Freeview and YouView customers, Pick TV will become Sky Sports 1. The free day will include Sky's ingeniously-named new show 'Saturday Night Football', when Sky will be showing a live Premier League fixture with a 5.30pm kick-off. 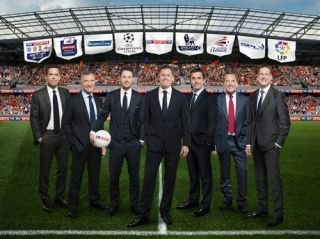 Sky Sports will show 116 live fixtures across the 2013-14 season – more than ever –but this year Sky's coverage has a new rival in BT Sport. BT Sport will be showing 38 live Premier League matches, plus European football, rugby, tennis and more, and is available free to BT Broadband customers. BT Sport is available on Sky, as well as via BT Vision+ and YouView. There's as yet no official word on the BT Sport channel appearing on Virgin Media.